Stock prices opened the second quarter with another sharp decline April 2 as investors grew increasingly worried about the rising U.S. trade dispute with China and a flurry of problems hammering the nation’s marquee technology firms. The market’s major indexes finished above their lows of the day, but the broad-based sell-off still sent the Dow Jones industrial average and the benchmark Standard & Poor’s 500 index into what Wall Street dubs a correction, a decline of 10% or more from their most recent highs. The damage is even worse for some popular tech stocks. Shares of Facebook Inc., Twitter Inc. and Snap Inc. each are down 20% or more from their 52-week highs, placing them in what’s known as a bear market. 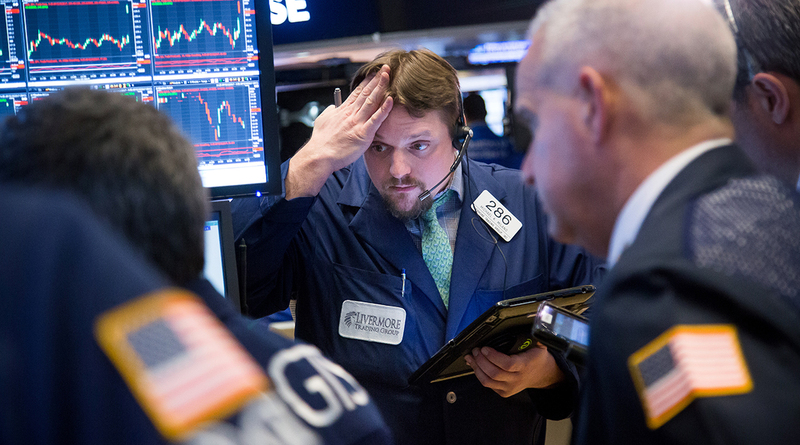 The Dow plummeted 458.92 points, or 1.9%, after plunging 758 points earlier in the day. That’s a decline of 11% from Jan. 26 when the blue-chip average hit a record high 26,616.71. One of the Dow’s 30 stocks is tech company Intel Corp., which dropped 6% after Bloomberg News reported that Apple Inc. is planning to use its own microprocessing chips in Mac computers, replacing chips from Intel. The Nasdaq index, heavily weighted toward technology, fell 193.33 points, or 2.7%. The S&P 500 tumbled 2.2% on April 2, giving the index a 10% drop since it, too, reached a record high Jan. 26 of 2,872.87. The S&P 500 has fallen in 11 of the past 15 sessions, and the barometer dropped below its 200-day moving average, which some consider a bearish technical sign. Investors are alarmed over the U.S. trade battle with China, which officially slapped tariffs on 128 U.S. products — including meat and fruit — it valued at $3 billion in retaliation for the Trump administration’s tariffs on imported steel and aluminum. The fear is that the dispute could turn into a larger trade war and substantially cut U.S. export sales. In response, investors sold off meat products maker Tyson Foods Inc., which fell 6%, and fruit spreads maker J.M. Smucker Co. fell 3.4%. Also weighing on the market is the rash of bearish news in the tech sector, including the data-privacy scandal at Facebook and the pedestrian fatality involving an Uber Technologies Inc. autonomous vehicle that rocked the self-driving vehicle market. Amazon is the fourth-heaviest-weighted stock in the S&P 500, Bloomberg calculates, and Amazon CEO Jeff Bezos separately owns The Washington Post, a frequent target of Trump’s ire. Tesla Inc., meanwhile, fell an additional 5% after a week of negative news surrounding the electric-car maker and investor fears about Tesla’s cash drain and its continued disappointing delivery numbers for the firm’s new Model 3 sedan. Tesla is down 19% this year. The tariff spat and the tech stocks’ woes have grabbed an outsize hold on investors’ psychology — and helped drive down stocks overall — because broader trends underlying the market weakened this year just as stocks had reached record highs, said Jim Paulsen, chief investment strategist at Leuthold Group. Stocks came under pressure because inflation and interest rates are expected to climb this year, both of which could carve into the corporate earnings growth that supports stock prices, he said. Indeed, the market’s pullback April 2 was across the board, and some of the big losers had little or nothing to do with meat tariffs and electric cars. Among the Dow industrials, for instance, Nike Inc. fell 3.5%, Home Depot Inc. lost 3% and JPMorgan Chase & Co. fell 1.9%. Some investors also have a quick trigger to sell because they’re sitting on massive profits that they want to secure. Amazon, for instance, still is up 55% over the past 12 months, and Netflix, despite tumbling 5% on April 2, still has a gain of 90% for the prior year. On the plus side April 2, Humana Inc. rose 4% amid reports that the health insurer is a takeover target of retail giant Walmart Inc., which fell 4%, in a deal that could be worth $50 billion.